A. Sivanandan, who passed away last month, was one of Britain's foremost and most influential thinkers on race, class and power. Virou Srilangarajah pays tribute to a remarkable life, and a towering intellectual and political legacy. “That he was still alive at the time, though in comparative retirement, makes that neglect even sadder.” So wrote Ambalavaner Sivanandan in 1980, commenting on the lack of acknowledgement by black political movements of the 1960s in the United States of the immense contribution and influence of Paul Robeson. Sivanandan pointed out that although they rightly honoured Martin Luther King and Malcolm X, they failed to acknowledge the struggles and sacrifices of Robeson that preceded them. These words echo the sentiment felt by activists, scholars and communities involved in the anti-racist movement in Britain with the recent passing of A. Sivanandan* himself, whose neglect by today’s generation is both disappointing and shameful. He was, for four decades, the Director of the Institute of Race Relations (IRR), and the founding editor of its journal Race & Class, which has had contributions from the likes of Noam Chomsky, Edward Said, Walter Rodney, Aijaz Ahmad, Chris Searle, Manning Marable, Cedric Robinson, Ilan Pappe, Basil Davidson, John Berger, Eqbal Ahmad, Angela Davis and John Newsinger. Sivanandan was in a class of his own as a thinker, writer and speaker. His deliberations on the issues of racism, immigration, capitalism and imperialism were a particular beacon of hope for activists and communities during the bleak Thatcher years of the 1980s. He was a visionary whose insights were original and whose ideas still remain relevant today, yet his name – with few honourable exceptions – is seldom, if ever, cited by the British left. Simply put, Sivanandan’s influence upon those involved in the anti-racist movement – whether they are aware of it or not – is monumental. Sivanandan was very conscious of how racism evolved – especially with changes in the economy and how reduced demand for labour consequently affected immigration policy. His landmark 1976 essay Race, Class and the State was the first serious and radical explanation of the political economy of race and immigration in post-World War Two Britain, and set the benchmark for all future analysis. Over the years he documented and explained the ‘rationale’ for the racism that was weaponised by the state and the popular press against black peoples (using the term in the political sense; i.e. those deemed outside of ‘whiteness’), including refugees, asylum seekers and migrant workers. 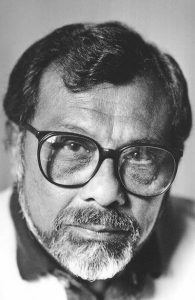 There was, according to Sivanandan, “The racism that discriminates and the racism that kills.” He mostly concerned himself with the latter, focusing on its primary victims: the working class and those catching hell on the streets, rather than the middle-class woes of well-to-do ethnic minorities. 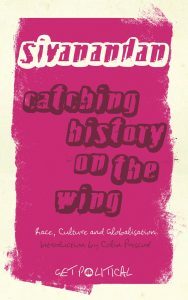 Often mischaracterised by the liberal-left, bourgeois academics and middle-class minorities alike as an out-dated relic from the past, it was clear to anyone who read and reflected upon Sivanandan’s writings or listened to him speak that, in fact, it was they who were being left behind by reality – a failure to ‘catch history on the wing’, as he put it. Take, for example, the continued inability of some elements of the left to incorporate race into their analysis of class. The latest and most notable illustration of this is the ‘Lexit’ brigade, who (mis) calculated that they could hijack the ‘Brexit’ narrative from the long-term clutches of the right – a mouse riding the back of a tiger, as one commentator astutely put it. He produced neither full-length works nor any academic treatises. Instead, Sivanandan wrote complex-yet-digestible essays of a prophetic nature for those at the barricades of the struggle, enabling those at the grassroots to see the wood from the trees. Some of these writings were subsequently compiled into separate anthologies on three occasions: A Different Hunger (Pluto Press, 1982); Communities of Resistance (Verso, 1990); and the most recent collection, Catching History on the Wing (Pluto Press, 2008). Politicians from the majority Sinhalese ethnic group – helped by the growing clout of the fascist-minded Buddhist clergy – used racism as a tactic in order to achieve a ready-made political majority at the expense of the numerically fewer Tamils. Their first crime upon independence was to render stateless, and then disenfranchise, the Tamils of the central hill-country, who were amongst the most militant workers on the island. These people were descendants of indentured labourers brought over from South India by the British in the mid-nineteenth century to toil on their lucrative tea plantations, which Sivanandan later described as a “colony within a colony.” The ruling elites next focused their efforts on the ‘indigenous’ Tamils. Sivanandan witnessed the total bankruptcy and betrayal of the Sinhalese left as they subsequently chose an exclusionary racial ‘solidarity’ over a united class struggle, eventually collaborating with the government. Though the means used were initially discriminatory legislation – orchestrated by the state through the avenues of language, education and employment – they soon evolved into targeted racial violence against Tamils, led by Sinhalese ‘Buddhist’ monks and goon squads. After surviving the 1958 anti-Tamil pogroms in Colombo, Sivanandan fled to London, where he walked straight into another episode of racial violence – this time the attacks on the black community in Notting Hill. Directly experiencing these two horrific incidents of violence convinced Sivanandan that he could not stand on the sidelines any longer, that he needed to study the root causes of racism in order to fight against it. When Sivanandan obtained work as a librarian at the Institute of Race Relations in 1964, it was a government orientated think tank used by British foreign policy planners in order to serve the corporate interests of its multi-national funders. After the so-called ‘race riots’ of 1958, the IRR began to focus more attention on domestic ‘race relations’ – as opposed to combating racism itself. In her obituary of Sivanandan, Liz Fekete, current Director of the IRR, made a point of mentioning his recent concern that younger generations of British anti-racist activists were ignorant of their own history, tending to focus solely on American movements such as the Black Panther Party for inspiration and guidance. However, Sivanandan articulated previously unknown stories of how black peoples had resisted on this side of the Atlantic, even when solidarity from their white comrades was rather lacking. 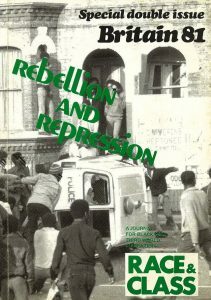 His 1981 essay From Resistance to Rebellion: Asian and Afro-Caribbean Struggles in Britain is one of the best examples of this alternative, history-from-below. It is an electrifying piece of writing – its opening lines encapsulating Sivanandan’s gift of joining the dots from the colonies to the mother country. The introduction begins in 1940, with Udham Singh’s hanging in London after his revenge shooting of ‘Sir’ Michael O’Dwyer – the man responsible for the 1919 Amritsar Massacre – but ends with the former’s lesser-known involvement in setting up the Indian Workers’ Association during his stay in England. The essay made a massive impact upon its first publication and, decades on, there are still numerous stories told by activists recounting how they would copy and distribute multiple copies of it everywhere. By incorporating and transmitting the unwritten racial dimension within the historical class struggle – something the orthodox white British left, including such luminaries as E.P. Thompson and Eric Hobsbawm (and today’s pale imitations Ken Loach, Owen Jones et al) have generally failed to do – Sivanandan inspired others to do likewise. His legacy can be seen, for instance, in the works of Satnam Virdee, Anandi Ramamurthy and Arun Kundnani; as well as the recent commemorations of the epic Grunwick Strike of 1976-78 – a struggle that was led by Asian women and had lasted longer than the Miners’ Strike of 1984-85. 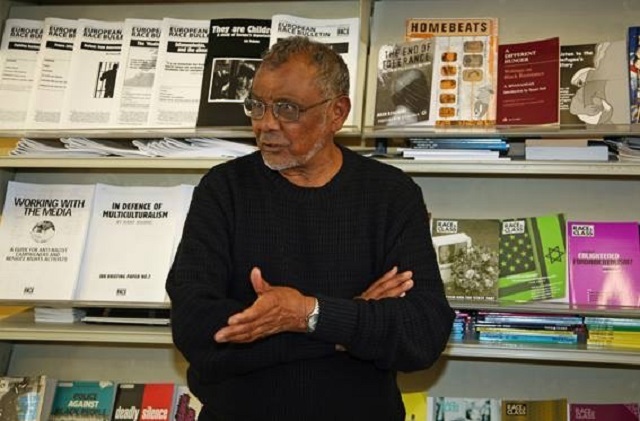 Sivanandan also had a pedagogical impact through an influential series of educational booklets published by the IRR in the 1980s that attempted to address the absence of black history in schools, particularly racism and its connection to imperialism. There were four booklets in total: Roots of Racism; Patterns of Racism; How Racism Came to Britain; and The Fight Against Racism – the latter two focused on the British context, whereas the earlier books were more general in emphasis. How Racism Came to Britain was especially explosive in its impact, resulting in a sustained witch-hunt led by the right against the IRR, and even attempts by the Secretary of State for Education to ban the books from schools. Whereas some on the left retained their endless faith in trade union agitation in social democracies, harking back to some Keynesian ‘golden era’, Sivanandan refused to go along with religious orthodoxies and rigid dogmatism. He forewarned of the massive changes taking place as developed countries within the capitalist metropolis evolved from industrial to information-based economies. These themes were brilliantly analysed and anticipated in essays such as Imperialism and Disorganic Development in the Silicon Age, written in 1979, and in New Circuits of Imperialism (1989). Sivanandan pointed out that labour in the west was so preoccupied with emancipating itself from capital, that it had not been able to prepare for the opposite scenario: with the development of technology, capital had been able to emancipate itself from labour, leaving the working class in the metropolitan countries paralysed, with no economic – and therefore political – clout. However, Sivanandan reserved sharp criticism for those who declared the class struggle – even within the imperial centre – as redundant or futile, consistently citing the crucial role of part-time, temporary or migrant labour, such as security guards, fast-food chain workers, porters, cleaners, etc. He described their precarious existence as, “rightless, rootless, peripatetic and temporary,” and without whose labour “post-industrial society cannot run”. However, as recently demonstrated by the long and arduous struggle of the cleaners at SOAS – predominantly women workers from ‘Latin’ America – even the toughest battles can be won by the most marginalised and exploited. With his holistic view of the world, Sivanandan stood in sharp contrast to the dogmatic Eurocentric Marxists who have dominated the discourse of the left (or what’s left of the left). Unlike them, he positioned his analysis of capitalism (i.e. ‘the system’) around imperialism (i.e. “the project”) and its devastating effects – via globalisation (i.e. “the process”) – upon the peoples at the periphery of the world economic system. Sivanandan would always demonstrate cause and effect, describing the economic policies (e.g. Structural Adjustment Programmes) of transnational organisations (e.g. the EU, the IMF, the World Bank, etc) and multi-national corporations, as well as their political and military agents, whether in the form of nation-states or through collective alliances such as NATO. He would explain how the actions of these entities caused the forced migration of people from the Third World – often as a direct consequence of war and poverty – on a mass scale into the metropolitan countries of the West, where upon arrival they would often meet new racisms and oppressions. Though critical of economic determinism, Sivanandan cautioned against the potential excesses of the politics of identity. In RAT and the Degradation of Black Struggle, written in 1985, he delivered a scathing indictment of the US-imported ‘racism awareness training’, which removed state and institutional responsibility for racism, instead turning it into a ‘natural’ social phenomenon independent of material conditions, a ‘white disease’. This type of approach is perhaps best exemplified by the ‘calling-out’ culture of social media, and the rise of the politically limited and intellectually lazy discourse centred on personal ‘privilege’. Today’s Twitter generation often prioritise the issue of who retains cultural rights instead of fighting for the right for an inclusive political culture, i.e. within the context of class. For Sivanandan, the concept of ‘the personal is political’ only concerns what is owed to one by society, whereas its inversion – ‘the political is personal’ – concerns what is owed to society by one. Stuart Hall was also rebuked for overlooking in his analysis the masses of workers throughout the Third World, upon whose exploitation these Eurocentric ‘New Times’ would be owed to and built upon. In fact, Hall had, in 1986, used the previous year’s hugely popular ‘Live Aid’ concert of Bob Geldof – Bono’s predecessor as musician-turned-missionary – as ‘proof’ of the changing political climate in Thatcher’s Britain. Sivanandan had no time for such liberal window-dressing, castigating Hall for changing the discourse of anti-imperialism into one of Western humanism and charity. Sivanandan ‘s The Hokum of New Times essay can also be interpreted as a prologue to the left’s capitulation under Thatcher; its submission to her mantra of ‘There is no alternative’ (TINA). He infamously characterised the political conclusions of ‘New Times’ as ‘Thatcherism in drag’ – an especially sharp denunciation since it was Hall himself who had initially coined the term ‘Thatcherism’, arguing many years ago that she was not ‘just another’ Tory. With his relentless critique, Sivanandan in some ways projected how the Marxism Today collective’s attempts to fight Thatcherism perhaps unwittingly led them to midwife the birth of New Labour and the ‘Third Way’ ideology of its intellectual guru, Anthony Giddens. The logical conclusion of this new government policy was the rise of a multitude of ethnicities, self-appointed leaders and cherry-picked representatives coming to the fore, disaggregating the previously militant black working class. Sivanandan had warned about the flight of race from class in 1983, telling communities, “We don’t need a cultural identity for its own sake, but to make use of the positive aspects of our culture to forge correct alliances and fight the correct battles.” It is important to note, however, that his earlier criticisms of multi-culturalism were specifically about the post-1981 state policy of divide-and-rule; he later defended organic, community-led multi-culturalism – so long as it was infused with anti-racism. This was in light of attacks upon this brief era of relative progress from nativists and advocates of ‘British values’ after the 2001 race riots in northern England, and the 9/11 and 7/7 terrorist attacks. In terms of his birthplace, Sivanandan’s lasting legacy is his epic historical novel When Memory Dies – probably the most ambitious and significant piece of literature written about Sri Lanka in the last century. It is his first and only novel, published in 1997 when he was in his early 70s, and, tellingly, took him around two decades to write. The novel tells, in three different parts, the history of the island: from colonial British rule, to the newly independent Ceylon and, finally, to the ethnocracy that rebranded itself in 1972 as ‘Sri Lanka’. 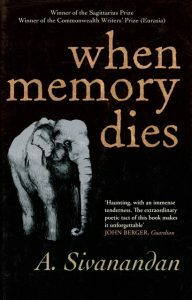 When Memory Dies is a story told not from the point of view of authoritarian presidents and prime ministers, nor that of jingoistic army commanders or bigoted religious leaders, but from the viewpoint of the subaltern – the ordinary people. It threads together various features of colonial rule in Ceylon, addressing issues such as the wretched conditions of the workers that plucked the tea for the imperialists; the hegemony of the English language over the natives; and debates between characters arguing reform versus revolution when deliberating over what form the class and anti-colonial struggles should take. 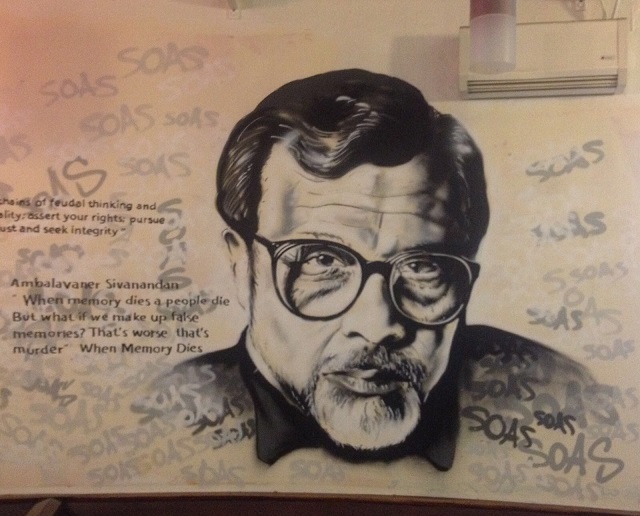 Alas, thus it came to pass: those frequently in the area may have noticed a painting of Sivanandan’s face – accompanied by the quote in question (picture in the photo at the top of the essay) from his novel – in the students’ union bar at SOAS. It is fitting that Sivanandan, whose funeral took place exactly forty-two years to the day that his hero Paul Robeson died, is honoured at SOAS – the institution where Robeson himself once studied and was later immortalised with a building named in his honour. Now, more than ever, it is time for those who tremble with indignation at injustice to acquaint ourselves with the writings of A. Sivanandan to help guide us for the battles ahead – to be proactive rather than reactive in the struggle for economic, political and social justice, both home and abroad. We must catch history on the wing. Virou Srilangarajah is a writer with a background in philosophy. He is a former volunteer at the Institute of Race Relations. He can be found on Twitter at @Virou_Nose.